Pam Spindola became a certified Associated Koi Clubs of America (104 chapters) judge in 2004 upon equaling the highest test score ever achieved for certification. A member of the Santa Ana Nishiki Koi Club (30 years) and the Southern California Chapter of Zen Nippon Airinkai (27 years), she not only judges in many koi (Cyprinus carpio) competitions, but she also responds to scores of speaking requests. In the world of koi, Pam has held an array of key leadership positions in clubs including president, secretary, and show chair. She was a member of the original AKCA board. 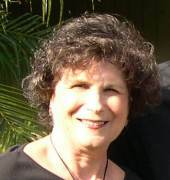 Pam, formerly editor-in-chief of Koi USA Magazine, has held editorships for Water Gardening Magazine and Pond and Garden Magazine. 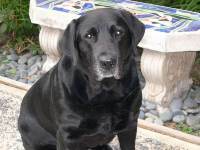 She has written numerous articles for major koi and gardening periodicals. She co-authored The Ultimate Koi published in the UK. Before becoming a judge, her dazzling fish won countless competitions. Pam raised her champion fish from small size rather than entering large ones purchased as "instant winners". Judging has not stopped her from the enjoyment of selecting and growing small koi that develop into marvelous specimens. Even though . . . problems exist, koi and plants can live together but only with careful planning of a sound design that benefits both entities. 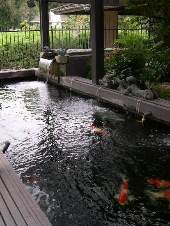 The fiberglass lined pond is an ingenious design of koi and plants together. 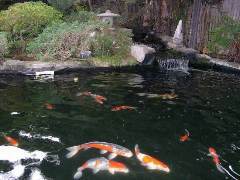 The owner, a retired architect, has created a koi pond in the center which is surrounded by a water garden. The koi pond has all the elements essential for healthy koi including a shade cover. The water garden which is separated from the main pond by a cement wall is bathed in dappled sun. The water in this area is still and shallow to accommodate the plants. The koi pondwater spills over into the water garden moat. The good aspects of this are that they share the same nutrients; the fish help the plants and the plants help the koi. The drawback is some types of water treatments for koi, such as adding salt, have to be avoided because of the detriment to the plants. We think that this design is a unique way to have the best of both worlds. Pam and Bob were thoroughly devoted to each other from the time they fell in love until separated in 1998 by death following Bob's 15-year battle with cancer. Originally, his doctors gave him only a few years to live. Then Bob found peace and relaxation from a new hobby - koi. His and Pam's interest in koi grew to the point that Bob became a respected koi judge well known as the King of Koi. She credits koi for helping to extend the few years to those extra 14 years. After persistent urging, Pam revealed, "I was a senior in college, when, on November 22, 1963, my life changed forever. Taking to heart the words of John F. Kennedy, I joined the Peace Corps promptly upon graduation from Cal State Northridge where I earned a B.A. in English with a minor in Spanish. "Fifty-two of us selected volunteers, ages 21 to 55 years, completed an intensive training program to prepare us for work in northwestern South America. The Corps assigned me to help Colombian social workers in a region outside of Colombia's capital, Bogotá. There I taught English and art, coached basketball, and gave whatever service I could to benefit the local community. "The Corps designated me to work with the local government. As a young woman in their male-dominated Hispanic culture, I found this very difficult. Nevertheless, I was pleasantly surprised when I realized that I benefited even more from this thorny experience than the country gained from me. Being close the capital, many important people would visit us to see first-hand the efforts of the Peace Corps. I met the then Under-Secretary of State, Jack Hood Vaughn, and the writer, James Michener. "After completing the two years of service, I entered the graduate program for Spanish in Middlebury, Vermont. This was a dream I had ever since my college freshman year. I remember staring at the poster of that idyllic campus with the chapel on a knoll overlooking the colonial style buildings. It was a special thrill to be a part of such a well-known and prestigious language program. "Then I spent a year in Madrid, Spain, taking classes leading to a Master's degree. Upon returning to the states, I taught in a middle school in Arroyo Grande, a small beach town on the central California coast. The following year, I accepted a high school position teaching Spanish in Whittier, California. During 37 years there, I soon enough became department chair and a mentor teacher for many years. Additionally, I took on many other duties outside the classroom. These were very hectic but fun times. "Back to the Peace Corps, out of the group of 52, 17 of us plan to attend a reunion this summer. We selected Yosemite because the oldest person in our group is now in her 80s and lives with her niece near the park. We thought it would be so nice for her to attend! Tonight, I am going to go through my memorabilia and put together some mementos to take with me. I normally don't like reunions, but this will be so much fun. We will probably sing "Kumbaya" and other songs of the 60s! "People in the koi hobby are like my extended family--like a special fraternity. Continuing with the koi hobby is a natural thing to do. Bob and I were always a partnership. We learned about koi together; he was just more outgoing! I suppose people thought I would give up koi and fade away as many widows of koi hobbyists do. Countless people strongly supported my decision to continue. However, some cautioned me to be my own person and not to second-guess by being under Bob's influence, even after he was gone. It has been a very liberating experience. I find so much to learn about raising koi. I am studying in the yearlong comprehensive KHA program. 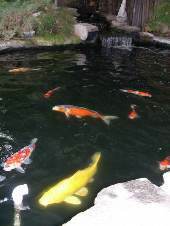 Koi Health Advisors study every aspect of koi husbandry from pond design and water quality to medications. I love a challenge! "Speaking of which, the alumni of my high school are holding the fourth annual golf tournament in Bob's memory. It raises scholarship money for worthy students. I have bought a golf outfit, purchased new clubs, taken four lessons and read one Golf for Women magazine . . . Am I ready? The event takes place Monday; I am sure I will be terrible but I will be with my brother's family. Bob's former students definitely love him and appreciate the inspiration he gave them . . .too bad he can't be here to see the remarkable influence he had on several generations of students!" Pam has retired from high school teaching. On a part time basis, however, she enjoys teaching Spanish at a nearby college. Pam maintains her koi collection in a 5,000-gallon (19,000-liter) concrete pond and a 2,500-gallon (9,500-liter) liner pond. Always seeking new horizons, Pam is looking forward to making future contributions. She is a director on the vital AKCA Project KHV (koi herpes virus) Committee. Pam also is planning a classification website that undoubtedly will interest many koi enthusiasts. I met Pam and Bob Spindola two decades ago when they crossed the country to attend the Koi Festival at Lilypons Water Gardens in Maryland. There the Mid-Atlantic Koi Club displayed their prize fish to thousands of visitors for the Labor Day weekend during which Bob judged their spirited competition. I consider Pam as a judge's judge and Queen of Koi. Pam and Bob both rank as people of the highest character - honorable, gracious, generous, kind, loving, inspiring.